We arrived at Aurangabad at about 5AM on Monday morning with a plan to see Ellora that day and Ajanta, 140 kilometers away, the next. We soon learned that both the Ellora Caves and the Ajanta Caves are closed on Mondays. We checked into the Taj Residency hotel (probably the most expensive of our entire India visit at about 3500 rupees), and Rita finished the night's sleep while I checked out the hotel grounds and then the surrounding neighborhoods. Realizing that we would have to see both sets of caves on Tuesday, we arranged for a car to pick us up at the hotel and take us to Daulatabad (a fort I wanted to see), Ellora, Ajanta, and on to Jalgaon to catch our train back to Mumbai. We had supper Monday night at "Food Lovers" where the ambiance, according to our guide book, was the best in town. I ordered sweet & sour chicken, being careful to emphasize NO HOT SPICEno black pepper, no red pepper, no chili power, nothing hot. What I got was hot & sour. I sent it back, explaining again that I wanted NO HOT SPICE. What came back was still hot & sour. Rita said it was delicious and ate most of it. I ate steamed rice. Rita's fish was old and perhaps freezer burned. When she said so toward the end of the meal, the cook insisted on making her more with fresh fish at no charge. It was about the same as the first batch. On Tuesday morning, we started our sightseeing marathon with a stop at Daulatabad, a fort dating from the 14th century or earlier, and having a complicated and well-engineered series of defenses. Rita and I walked about half-way to the central bastion, and then Rita returned to the car and a cup of tea, while I continued on to the top. Our second stop was Ellora, where there are 34 caves that are described as "the pinnacle of Deccan rock-cut architecture". They are religious shrines carved between 600 and 1000 AD by Buddhist, Hindu, and Jain artists. We thoroughly checked out the first group of 15 caves, and were impressed with the amount of work and skill required to complete these projects, and all before jackhammers and laser levels. After a less thorough inspection of the remaining caves, we moved on to Ajanta. The Ellora caves contain large numbers of carved images and statues, while the Ajanta caves (which are much older, dating from 200 BC) contain mostly wall paintings. By the time we reached Ajanta, it was mid-afternoon and it was very hot. As Rita huffed and puffed up the stairs toward the caves, she was followed by four guys carrying a chair on two poles and offering her a ride. They stuck with her almost to the top, but Rita was determined to make it under her own power, and she did. After checking out the caves, we returned to the car for the trip to Jalgaon. We arrived in Jalgaon about four hours before our train was due, and with Rita in desperate need of a clean bathroom. We rented a room in the first hotel we found for the bathroom, TV, and a quiet place to rest and wait for the train. This was a basic room with Indian-style toilet, no soap, towels, or toilet paper, and a missing showerhead. At 10:30 or so, we walked to the station and boarded our train for the overnight trip back to Mumbai. buried elsewhere under a large mound of dirt. 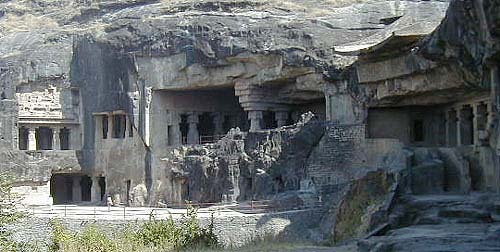 there are 34 caves at Ellora. the picture) in one of the Buddhist caves at Ellora. to show the carved supporting columns. on three separate levels with connecting staircases. Parvati in an Ellora Hindu cave. in the Buddhist Ellora caves. curved canyon that follows a bend in the river. Rita rehydrates outside one of the Ajanta caves. The temperature was in the mid nineties.